The artists who created these beautiful Toronto Star Weekly covers have been mostly forgotten, so it was a delightful surprise to hear from a woman whose great-aunt, Elizabeth Cutler, was a regular contributor to the magazine. Sheree Meyer of Orlando, Florida shared with me her memories of her talented Great-Aunt Betty. If you have been following Wartime Wednesdays, you will know that I’m very fond of the old Star Weekly covers. During the war, my mother June Light of Battleford, Saskatchewan, cut out these oversized magazine covers, sixteen by eleven inches, and stuck them into a scrapbook. As a child, I loved looking through the scrapbook at the colourful images. The Toronto Star newspaper published this weekly newsmagazine, primarily devoted inside to black and white photos, from 1910 to 1973. I’ve already published several dozen covers that you can see here by clicking on this title and scrolling to the bottom of the page: Star Weekly at War. And if you would like to see a sample of the magazine’s inside pages, click here: Inside the Star Weekly. From time to time, I get emails or phone calls from people wanting to know if their old Star Weeklies are worth anything. The answer is: probably only a few dollars. However, if you want them to go to a good home, contact me. I know an Ontario collector who shares my enthusiasm for the old wartime magazines and would love to take them off your hands. I have often wondered about the illustrators themselves. 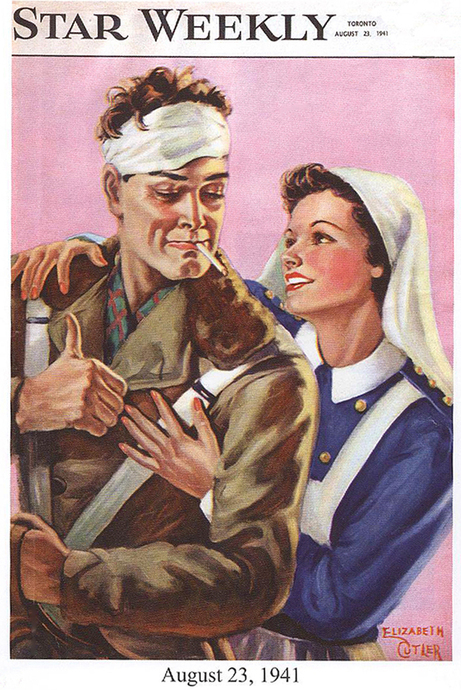 During the war, from 1939 to 1945, the magazine tried to boost morale using sentiment and humour, and they hired illustrators. Back in those days, you could earn a respectable income as a freelance illustrator or fiction writer, by selling your work to many popular periodicals. Copyright has expired on the artwork now, and astonishingly, the Toronto Star never kept copies of its own weekly magazine. As well as some lurid battle scenes by male illustrators like Britain’s Montague Black, the Star Weekly also loved the sweet, sentimental covers. Elizabeth Cutler was an artist who specialized in heart-tugging scenes like the top photo, showing the nurse comforting the wounded Canadian soldier. So it was delightful to receive a phone call from her great-niece Sheree Meyer, pictured below, who stumbled across Wartime Wednesdays when she was trying to find out more about her great-aunt, Elizabeth Cutler. Sheree lives with her husband in Orlando, Florida, where she works for a major hospitality company, and she has been acquiring all the samples of her great-aunt’s work that she can find. Sadly, most of Elizabeth's work has been lost, but Sheree has managed to purchase a few old magazines online. During our correspondence, Sheree shared with me what she knows about her Great-Aunt Elizabeth, or Betty, as she was called by her family. Like many other Star Weekly contributors, and in spite of the patriotic Canadian content, Elizabeth Cutler wasn’t Canadian. She was born in 1888 near Kiev in Russia, now part of Ukraine, and came to the United States as a child in 1890 with her parents, Samuel and Minnie Kotlarsky. Samuel’s father Mordechai Cutler (changed from Kotlarsky) and his wife had already immigrated to the United States, and his father was one of the founders of Carmel, New Jersey, so that’s where her parents settled first. Later they moved into New York, and went on to have seven more children after Elizabeth, including Sheree’s own grandmother, Dorothy. By the time of the 1920 census, the family was living in Brooklyn, New York, and four of the daughters were still residing at home, including Elizabeth, who was listed as 31 years old. She had been engaged once, but the man wanted to move away, and Elizabeth refused to leave her family. All of the children settled in the New York area and remained a very close-knit family. Elizabeth chose to live with her widowed mother Minnie, who was losing her sight; her youngest sister Jeanne, also widowed at a young age; and Jeanne’s baby Carolé. One can assume that baby Carolé was the centre of attention in a household of women, and it is believed that she was the inspiration for some of Elizabeth’s work! 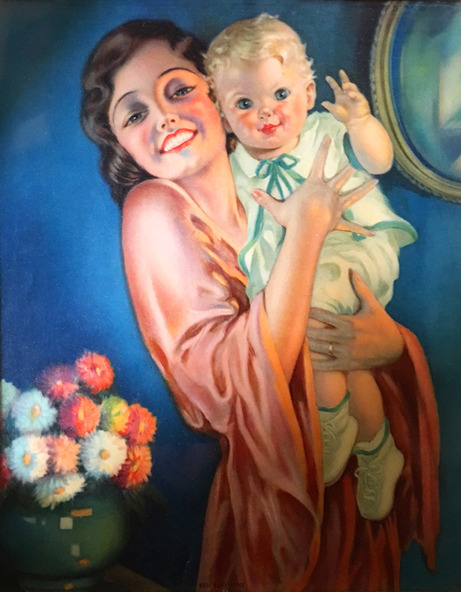 Carolé’s husband is still living, and he says that this illustration titled “Baby Mine” looks very much like Jeanne and her little daughter Carolé. Using the same pose, Elizabeth created another very similar illustration, probably for a calendar, although the original purpose of the print is unknown. Although it's difficult to see a resemblance in the wonderful old photograph below, the smiling mother Jeanne is the woman on the left. She has her arm linked with her husband Herman Osherhoff. The other woman is one of Elizabeth Cutler's other sisters. Sadly, Herman died and left Jeanne alone with her mother, her older sister Elizabeth, and her charming baby Carolé. Elizabeth sold her artwork through an art agent in Brooklyn. Although the household income was supplemented by other family members, no doubt the proceeds from her illustrations brought in some welcome funds. 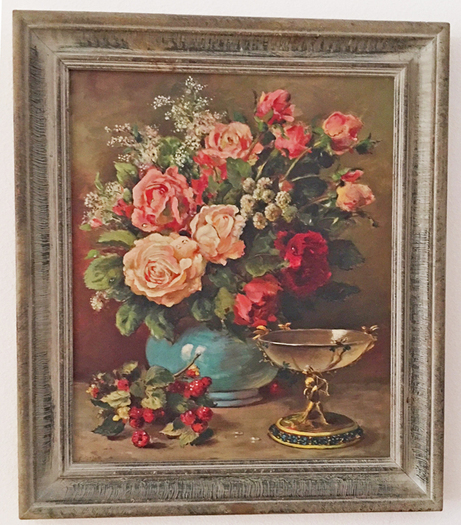 Her illustrations were sold to many mainstream publications such as the Star Weekly, and Elizabeth also did calendar illustrations and original oil paintings, some of which remain in the family, like this gorgeous still life. It appears that Elizabeth had a long career as an illustrator. 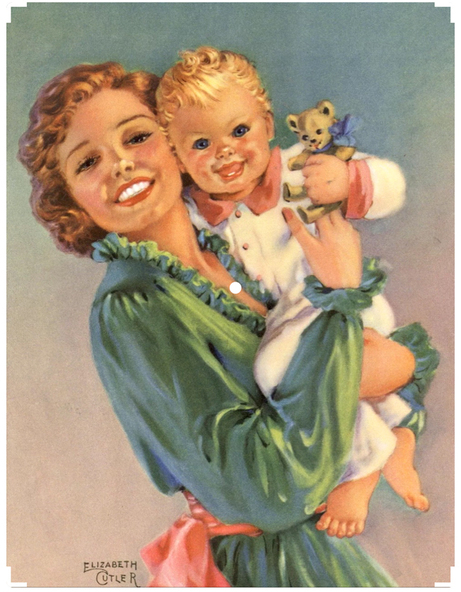 The earliest sample Sheree was able to find is this Prudential magazine cover, titled "Watch Me, Daddy!" dated February 1936. You will note her favourite subject: a mother with a golden-haired tot. When the Second World War began in 1939, Elizabeth was 51 years old. Although the United States had not yet entered the war, her agent succeeded in selling several of her covers, produced with her Canadian audience in mind, to the Star Weekly. 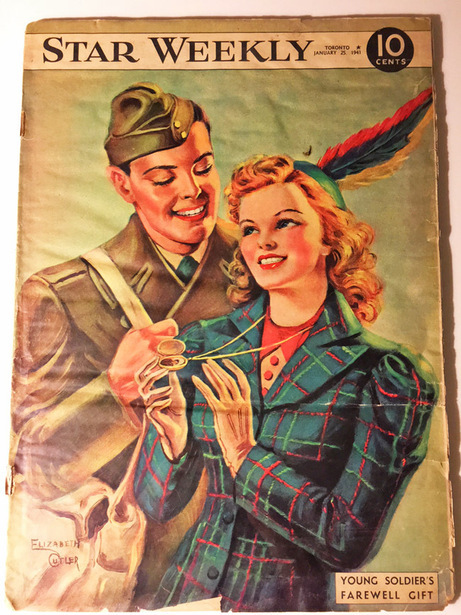 The earliest Star Weekly cover located by Sheree is this one of a Canadian soldier presenting his girlfriend with a locket, titled "Young Soldier's Farewell Gift," dated January 25, 1941. 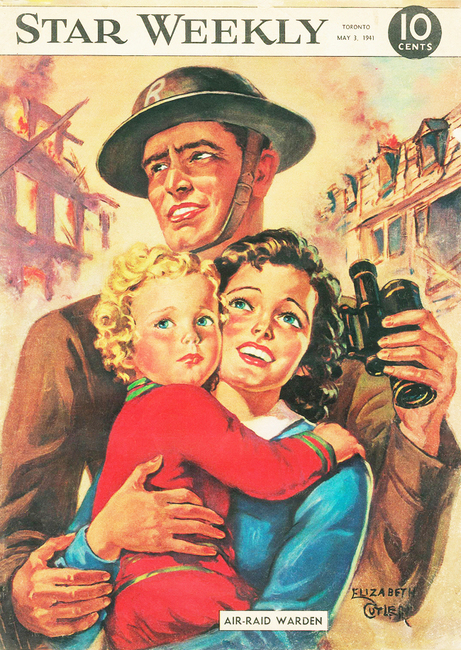 A few months later another Elizabeth Cutler cover appeared, showing a British air raid warden, probably during the bombing of London, dated May 3, 1941. Again we see the mother with the little blonde girl. The United States was drawn into the war on December 7, 1941, when the Japanese attacked Pearl Harbour. 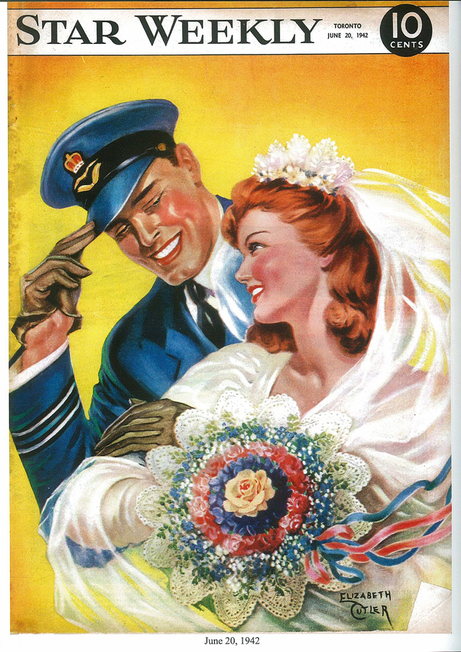 The following year, Elizabeth created this June bride for the Star Weekly, being wed to a handsome Canadian air force officer. I love the way he is saluting his gorgeous red-haired wife! 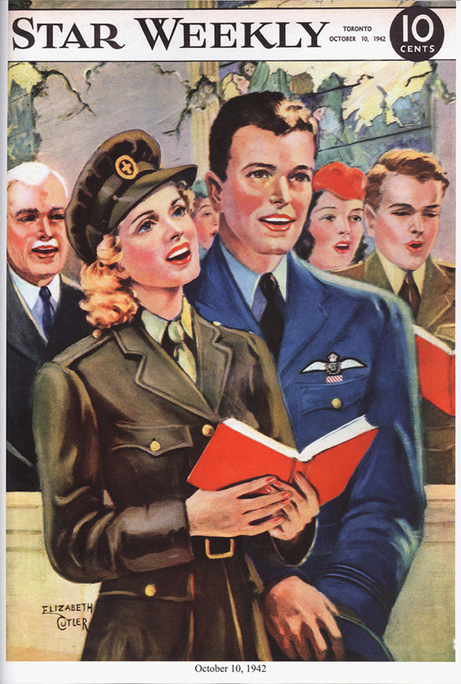 Another Cutler cover appeared on October 10, 1942, showing a Canadian couple, both in uniform, sharing a hymn book in church. This was probably a nod to the increased church attendance during the war, as people everywhere prayed for their loved ones to come home safely. Elizabeth's work wasn’t restricted to the Star Weekly, however. 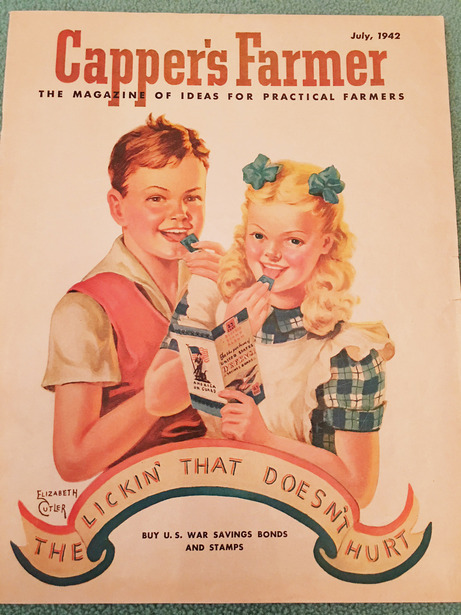 One of the publications that carried at least one of her cover illustrations was Capper’s Farmer, a monthly farm journal based in Topeka, Kansas, started by agricultural media magnate Arthur Capper, and widely distributed throughout the region. Capper’s Farmer included a short description on the inside cover about the woman who created the cover illustration, Elizabeth Cutler, along with a tiny photograph. 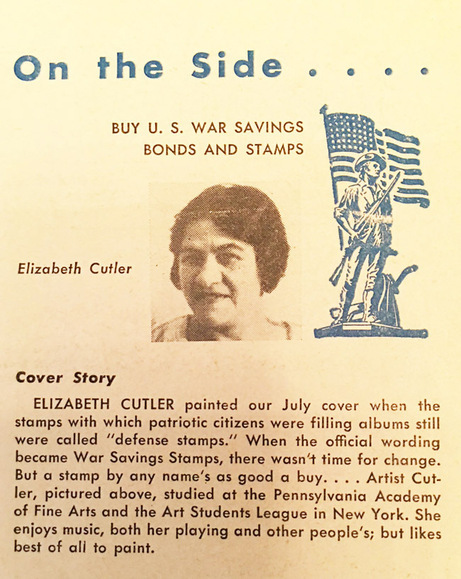 The text reads as follows: "ELIZABETH CUTLER painted our July cover when the stamps with which patriotic citizens were filling albums were still called “defense stamps.” When the official wording became War Savings Stamps, there wasn’t time for change. But a stamp by any name’s as good a buy . . . Artist Cutler, pictured above, studied at the Pennsylvania Academy of Fine Arts and the Art Students League in New York. She enjoys music, both her playing and other people’s, but likes best of all to paint." Sheree says Elizabeth’s reference to music was typical, since the Cutler family was very musical. Elizabeth’s father taught violin lessons, and her younger sister Molly attended the Juilliard School of Music and became a great pianist. 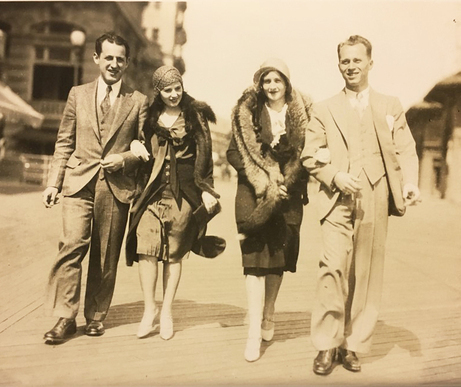 In the days of vaudeville, Elizabeth’s brother Moe was the orchestra leader at the Palace Theatre in New York, and later belonged to an orchestra that performed for a national radio program called Your Hit Parade. Sheree’s own father, Herbert C. Meyer, was also musical. As a boy he rode the subway by himself to his Aunt Molly’s house to receive piano lessons from her. “He was always singing, and he loved to dance,” Sheree told me. Sheree also dimly remembers her great-aunt, although she was a child at the time. “After their mother Minnie died, my great-aunts Betty and Jeanne continued to live together. My father would make the long drive into New York on Sunday, and bring them out to our home in Long Island for dinner. Elizabeth continued to sell her illustrations for several years after the war. The last known commercial covers she did were for the Star Weekly in 1950, when she was 61 years old. 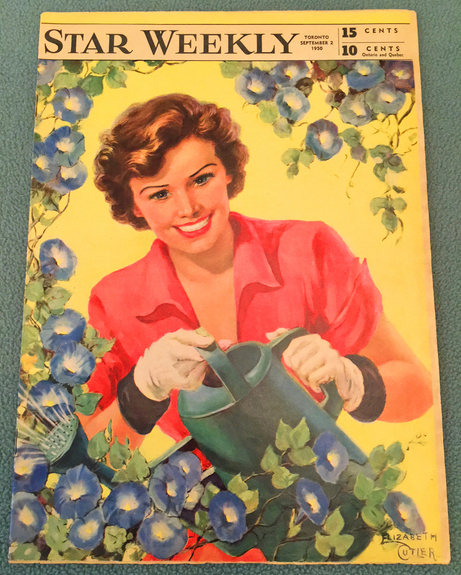 The first one dated September 2, 1950 shows a woman with a watering can, surrounded with blossoms. 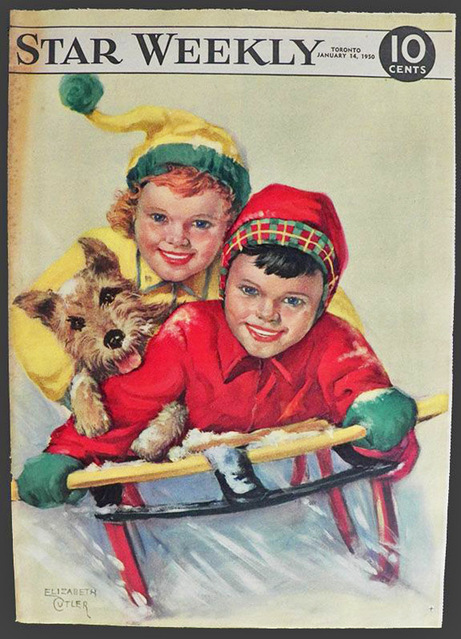 In one of the last examples of Elizabeth's illustrations, dated January 14, 1950, she returns once again to her favourite theme: rosy-cheeked, laughing children. Elizabeth Cutler died in 1968, at the age of 80. Sheree Meyer is still seeking examples of her great-aunt's work, so if you are fortunate enough to find anything, please contact me. 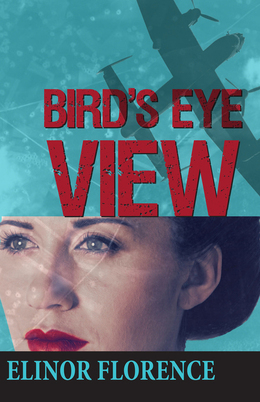 Thank you so much, Sheree, for telling the readers of Wartime Wednesdays more about this fascinating woman, who made her own small but important contribution to the war effort. 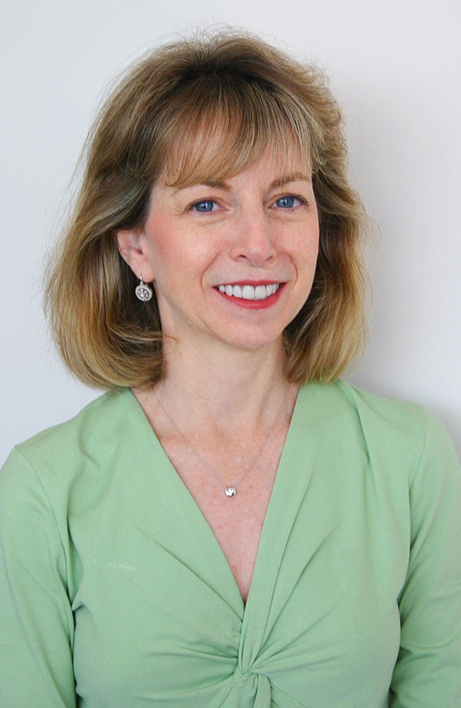 Rest in peace, Elizabeth Cutler. 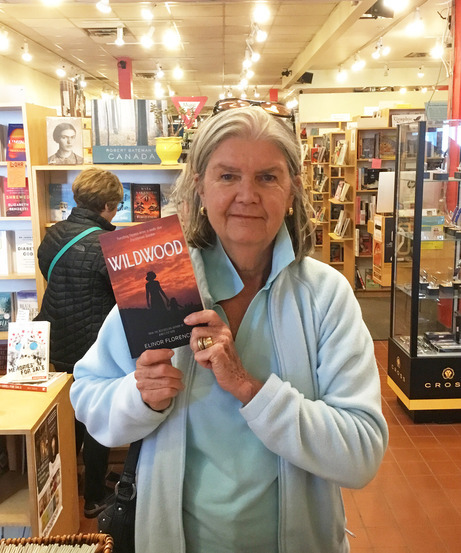 I asked people to send me photographs of themselves with my new novel Wildwood, wherever they live, and so far I have received about two dozen pictures from across Canada and beyond. 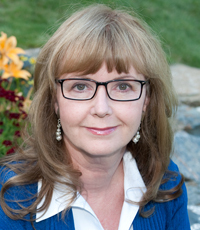 Please send me your photo, and I'll post it on my Elinor Florence-Author Facebook page. This is Dawn Kellock standing inside her favourite neighbourhood bookstore called The Bookshelf, in Guelph, Ontario. Thanks so much, Dawn! This is my schedule for the next few months. At some of these events, I'll be giving a slide show presentation; at others, I'll be signing books only. More events may be added during the year. To receive my monthly Wartime Wednesdays blog post and my current schedule, sign up by entering your email address in the yellow box on the top right-hand side of this page. I hope you are enjoying the warm weather at last!